We are confident that our personalized service, detailed pre-trip information packages, in-house travel professionals, and our ability to customize trips – without the middle man – will please the most discerning traveler. If you want a second opinion and know of one of these fine travel agencies, please feel free to contact them to ask about PRG. We are certain they will confirm that PRG is the most experienced and comprehensive outfitter in Argentina. Tailwaters Fly Fishing Co. | Dallas, TX. Worldcast Anglers | Driggs, ID. Yellowdog Fly Fishing Adventures | Bozeman, MT. The Fly Shop | Redding, CA. Urban Angler | New York, NY. On behalf of Shaun and myself, I want to thank you both for completely exceeding our expectations! You provided us with the most fantastic fly fishing trip I have ever been on!!! Your selection of guides for us was phenomenal, Pablo knew his business and how to treat us Montanans. And how fortunate you are to have Esteban. We fished with Alex, a great guide, and his father George was very helpful also. Fishing on Lago Filohuahum, we boated close to 60 fish 19 inches and bigger all on a dry fly. Shaun even landed a nice 25 inch brown. In looking at my diary, we landed 15 fish over 24 inches during the trip. We fished on our own 4 days and never caught over a 16 inch rainbow, so we are sold on your guide services! I am so excited when I tell friends about the trip, I hope you can handle all the referrals ! One of my best friends spent 3 weeks in New Zealand while we were with you…he caught only one fish, he said all the rivers were very low and warm with no rain. He is thinking Argentina next year. Both Shaun and I hope to return next year!!! Well, I have just about recovered from our trip with PRG and thought I’d let you guys know what a great time we had. When we got back from there 2 years ago, Debbie said it was the “best trip she had ever been on”. Given that endorsement, I had thought maybe we should just let Argentina and PRG be for awhile and try something else this time. I mean after all, what a great way to remember an adventure, “the best ever”. Since our friends the Schad’s were interested we decided to do the trip again. Here are some comments: Love the new lodge; food is even better, if that’s possible. At least I ate like it was; all the guides, assistants and lodge staff as friendly, knowledgeable and accommodating as I remembered. On this trip, I found out you have filled a void in your program that I did not know existed. 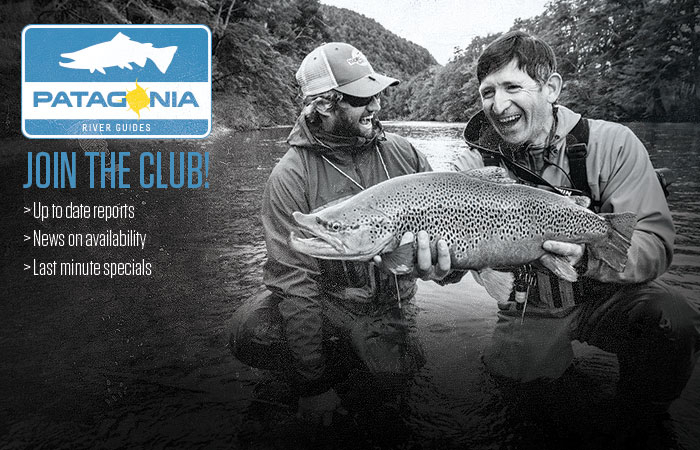 With the addition of PRG North, you have added a new dimension of fishing and hospitality to you overall program. I love what you have at Trevelin but experiencing the different types of fishing that Alex has up north along with our stay at Estancia Huechahue made this trip even more complete than last time. The guides at PRG north and the folks at Huechahue lived up to the standards we have come to come to expect from PRG. Unhappily, Elizabeth and I, after a long but uneventful return trip, are now back in Phoenix. We want to thank you for your efforts in putting together for us the single best expedition fishing trip from start to finish that we have ever had the joy of experiencing. The combination of fishing, places, and people were remarkable. Far better than we were expecting (and we were expecting a lot to begin with!). Great Job!! Of course, planning for our next trip starts today and we’ll be in touch soon about times and places. Thanks so much once again! After a wild last second aborted landing due to wind we arrived in Esquel Patagonia with Dave and Sarah. Sunny, warm and windy. Checked in to Patagonia River Guides lodge at the base of the mountains and were warmly welcomed by Rance and Travis, the boys from Montana whom we befriended 2 years ago and have set up a great fishing operation centered at their log cabin style lodge. The first day of fishing we floated down the Rio Grande River, also known as the Futaleufu river (Mapuche for big river). A sunny warm day with little wind. Everyone caught lots of rainbow and brown trout on dry flies. It was a beautiful float in wonderful scenery. The second day we had requested a special trip to Lago Menendez. I tried this trip 2 years ago but was literally blown out of the water by fierce winds and sideways rain. This is a lake that is not part of their regular program as it involves a drive, then a boat trip across a large lake then going up a river to another lake, then trailering the boat across land to go around a large rapids to enter Lago Menendez. Once you are on the lake, it is a VERY large lake you boat several miles, passing a gigantic glacier and numerous waterfalls. Due to the winds and the approach of a storm Sally and Sarah elected not to go, so Dave and I took the chance. The girls fished the Rivadavia River, protected from the wind as it flows thru a canyon between two lakes. The first part of the trip we pounded thru wind and chop, the river was calm, we could see rocks on the bottom at 35 feet deep, so clear was the water. After we got past the glacier on Lago Menendez we found a wind protected area of the lake. This lake only gets fished 20 or so times a year as it is so hard to get to and there is so much other fishing water. It also takes a while to get to the fishing. Once there we started “sight fishing” for rainbow trout. The water is so clear you can spot the fish from 40 feet away, and if you cast within 6 to 10 feet in front of them from a good distance away they most often swim over an slowly take the dry fly. They take it so slowly that it is hard not to strike too soon. We took turns casting from the front of the boat. These are all big rainbows. We do not know where the small ones are in the lake as all we caught were fish we measured over 19 inches up to 24 inches, some bigger ones got away by bending the hook or going down and wrapping the line around submerged logs. We also “blind” cast for brown trout when we saw big submerged logjams or rock piles. We were rewarded several times by big browns emerging from the shadows to hit the dry flies. We were having such a good time, we postponed lunch till 3:30 then ate a fast shore lunch watching the storm approach. We ate in the shadow of an Alerce tree that was 2000 years old. We ate on a sandy beach where a crystal clear stream flowed out of the woods into the lake, no human tracks were to be seen. We never saw another boat all day. After lunch we went back to fishing, but only got a few before the storm hit – it just hammered us! Wind, hard rain, and the temperature dropped fast. The guide said we best go, so we went, but with smiles on our faces as it was one of the best days trout fishing ever!!!! Thank goodness we had our small flasks of Johnny Walker green label scotch to ward off the wind chill as we retraced our journey back. This was a very special day for me as I had heard of this lake on each of my nine trips to Patagonia and was able to verify the stories were true! Meanwhile, the Rivadavia is an extremely clear fishery known for beauty and difficulty of catching large fish that won’t bite. Sally & Sarah slayed them, the guide saying it was one of the five best days he ever had on the river in 20+ years. That evening over Argentine Malbec wine and red deer steaks we had plenty of tales to share. Third morning, storm abated leaving fresh snow over Andes and down the foothills. Dave & I went to try and beat out the girls on the Rivadavia but the fish were back in their hard to entice to a fly mode. Caught some good fish, but not the numbers caught the day before by the girls. Saving the day was Dave’s last hour 26 inch Brown trout, which earned him a membership in the 25-inch club at the lodge. Very few this big are caught here and guide was telling Dave to savor every minute of the epic Battle of such a fish in a fast flowing river full of submerged trees . I remember the guild rowing hard and yelling “I really want to land this fish!! !” The guide at last got the boat into some “soft” water and Dave got the fish to net, what a moment! The next day, we packed up and went to Rance and Travi’s Rio Pico camp. On the way we stopped at one of my favorite spring creeks “Arroyo Pescado” It was blowing sideways, almost impossible to cast. I mean it was gusting to where you needed to tie your hat on to keep your hair from blowing off. This spring creek is in the middle of a dry grassy cow and sheep farm, springs boil up from the ground to form a small river or big creek. Water conditions are such the trout grow really well. One of the major food groups are fresh water shrimp, this is why there are always pink flamingos there, also lots of parrots, Sally spotted a black breasted buzzard eagle nest, with a returning eagle, and got some good bird photos which I will send with this report. With some creative casting we all caught nice trout, but nothing like we have in the past when the wind was a tad bit calmer. But that’s fishing and that’s Patagonia. We ate lunch and headed on to the Rio Pico. Now this place is out in the center of nowhere. Another log cabin lodge with snow covered mountains out every window, a pretty spot worth the 3 hr. drive mostly on gravel roads. The next morning the wind was still keeping us company; the guides selected a lake as it was in a protected Valley. The drive to the lake took us through several ranches, the views we spectacular, snow cover mountains, grassy valleys, very little trace of mankind, we spotted more condors overhead. We came to a locked gate, our trusty guide John had the key. We got to the lake and geared up, still windy, we rowed to a more wind protected area and started fishing, wham, Sarah lands a rainbow 25.5 inches, she is now in the coveted 25-inch club at the Patagonia River Guides Co. Good start! About 20 min, later Dave lands a 26-incher! WOW, that is a big trout! Now he is a member. An hour passes, Sally hooks up, fish jumps, it is BIG fish – got off – darn. Sally hooks up again, lands a 26-inch rainbow, wow, now they are all in the club, me? Not even a rise. The feeling of pride felt toward my co anglers starts to slowly fade to a wee bit of envy as the time passes. Dave and Sarah land two more nice fish, I feel the pressure building. We have a nice shore lunch and a short hike up to the top of a flower covered hill to see yet more mountains and lakes, very pretty place. We are back to fishing and no action except for the windy kind, then YES my fly gets hammered, fish jumps, it is BIG, does NOT come off, as the fishing day is just about over I think I held my breath till that big boy was in the net. I finally made it into the club with a 25.5-inch rainbow. John and I were very happy and relived. With that fish boated we headed back to the lodge. On the way home we stopped at a small grocery store that had posted a sign, CORDERO (baby lamb), we stopped had bought a quarter of a whole one and had it for dinner, fabulous. One days fishing got us all in the club, we took a group photo with our awards back at the lodge and hoisted a toast all round! Not a lot of fish but all big fish, a good day in Patagonia. I had dinner with Susie and Whitney last night and we had so much fun reminiscing and thinking of the wonderful times each of us has spent at PRG. Good news – Whitney was really happy to take my converter plug back to you so you will probably have it back in April when she is hoping to come and fish. We laughed a lot as I told them of my time there, arriving knowing no one and very little about trout fishing. I still can’t believe how nice and understanding everyone was to me, even when I showed up wearing golf gloves because I honestly didn’t know what fishing gloves were and when I asked in MN in Feb., the stores just looked at me and said to forget it! Anyway, we all came to the conclusion that you and all the people there are incredibly caring and thoughtful and we are so very grateful to all of you for the wonderful memories that we will hold forever in our hearts. Thanks again for everything! Alex and I would like to thank you again for providing all it takes to to put together a trip of a lifetime for us. From the moment of our first contact with PRG to our sad departure we were treated so wonderfully. Travel to Esquel was made easy and Julian’s greeting at the airport was a relief. Due to the graciousness of everyone on your staff, we were treated so well, making us feel like long time friends. The lodge, meals, and daily fishing adventures were run with professionalism, efficiency, and a warmth that suffused the entire organization. We couldn’t have felt more welcome nor better cared for. This was the finest lodge, food, people, and fishing we have ever experienced. Oh, ya, I guess we did go there for fishing. The fishing was terrific- no doubt you have heard that a time or 2. As good as it was, however, I can’t think of the experience as just a fishing trip. We met so many nice people, starting with your staff and extending to your guests. Alex and I agreed that we could not think of anything that would have made this trip any better. Thanks again for running set a wonderful organization and for providing the means for us to have had such a fabulous trip!!! By the way, the fishing was the best we’ve ever had. If we can make it happen, we will see you in the not too distant future. We wanted to express how great our trip was last week to PRG. Its on the top of our list as one of the best vacation we have taken! The Lodge, staff, scenery, food, attention to detail and overall adventure blew away all of our expectations. We loved the variation of terrain, rivers and fish that we were able to experience, all within an hour of your spot. The knowledge of the area by all the staff and guides was an added bonus ( Including Caitlin’s tour of the valley 🙂 . Its rare that we go on a “full service” trip like this, but the bar has been raised for sure. Some of our local Outfits in Jackson should take some lessons from you guys. I guess we have to come back…. and bring some friends to fill the lodge. Thanks for putting up with the girl who is “allergic to streamers” and for having the patience to fish with the two of us until dark! Open invitation to whomever wants to come to Jackson -any time, We have plenty of room, a dory and we can even row you guys.